djkardkreations: 2014 World Cardmaking Day! Did you know we card artists have Our Own Day?!! In spite of modern technology and instant messaging and video chats and so many people thinking they don't have time to bother with sending cards in the mail any more, cardmaking is a maxibillion dollar industry and we have Our Own Day!! Just imagine if word of this spreads and people once again start to eagerly anticipate their daily mail delivery, hoping someone sent them a card?! It could resolutionize the world! That happiest of sunflowers was created with a NBUS die and stamp set by My Favorite Things and they are all glittered up with WOS. The pretty paper is by SU. I was invited by my sweet and talented friend Lyndal to join in a wonderful day of celebration and prizes being hosted by the amazing Winnie & Walter. For this special event, you are not required to use W&W products, which is very cool because I haven't yet ordered any of their items on my wish list what with my NBUS Mountain and all. If you'd like to join in, you will find a link and a gallery for your beautiful cards on their site. Thank you to W&W!! ETA: I didn't know there were going to be specific themes when the invite went up on Facebook, so since my card doesn't work for any of the themes and I don't have time to make another, I won't be entering, but I sure hope you can click over and get the directions and join in! Fusion Card Challenge fans will (hopefully) recognize that my card today was inspired by their current photo/sketch inspiration. It's been a while since I made a full fusion creation using both sides of the coin! Since lots of snippets of scraps went into my card, I'm delighted to have just gotten my foot in the door to join my playmates at Pixie's Snippets Playground before the gate closed! 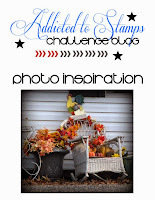 And over at Addicted to Stamps and More I'm joining another fall photo inspiration party! Each of these challenge links will provide you with detailed information about the challenge rules, sponsors, and prizes. As I mentioned in my last post, my future posts will be scheduled for a few weeks and I won't be able to play / link to challenges or visit as much as I normally do. I didn't mean to confuse you; I wasn't planning on doing this post, but I couldn't turn down Lyndal's invitation to celebrate WORLD CARDMAKING DAY!! I hope wherever you are, you are celebrating, too! Ann Tuck of Cardmaking 101. Ann is a doting grandmother of six who has been blogging since 2012. She has been loving paper crafting for about four years and she enjoys playing in the challenges. Her enthusiasm for this hobby emanates from her blog and I know you'll love her very creative and happy cards! Sam of The Crafting Garden. Sam has been blogging since 2007!!! You know how I get really becited about our friends who have been blogging for so long because it means there is SO much wisdom and inspiration available to all of us! I spent quite a good long while over at Sam's relaxing and enjoying myself completely and I know you will, too! Cindy van Oorschot of Creating with Cindy. Cindy is taking a break now, but there is still plenty of card art inspiration for you to enjoy and we hope Cindy will be back to blogging soon! Darcy Schroeder of Crafting With Darcy. Darcy has been blogging since January of 2013. She is a life-long crafter who has been scrapbooking and making cards for the last twenty plus years. Darcy is a published card designer and award-winner. You will find oodles of goodies and inspiration in the pages of Darcy's blog! Ingrid Kristina V. of Ingrid's Crafts Corner. Ingrid has been blogging since January of this year. She is also a published card artist, designer, and challenge award winner. Her cards are always bright, colorful, and stunning. She is currently making the most amazing cards using Brushos, all under the watchful eyes of a one-year-old! Happy World Card Making Day to you, Darnell!! Your card is gorgeous!!! I love the bow underneath the centre! That's gorgeous :) And Happy WCMD!!! Happy World Cardmaking Day! Such a beautiful, cheerful card, I love all the added texture. I hope you have a wonderful vacation with your sisters and friends. What a gorgeous sunny card with that beautiful sunflower. Just what's needed this morning as its very dark and wet here! Great news to find out that there is a Word Cardmaking Day! Good excuse to leave the household chores until tomorrow! ;-). Pssst, just found you comment about waffles and quail eggs! How did you know I've been experimenting with quail eggs recently? Been peeking through the kitchen windows huh?! First off what a wonderful card you've made, I absolutely adore sunflowers and most years grow a few against a sunny fence in the garden. I love your brick background and the rustic twine, I can almost smell summer with this card! And finally oh my gosh I love your craft room ~ I'm soooo going to insist on having my own chocolate drawer from now on! Wow! Beautiful card, Darnell! 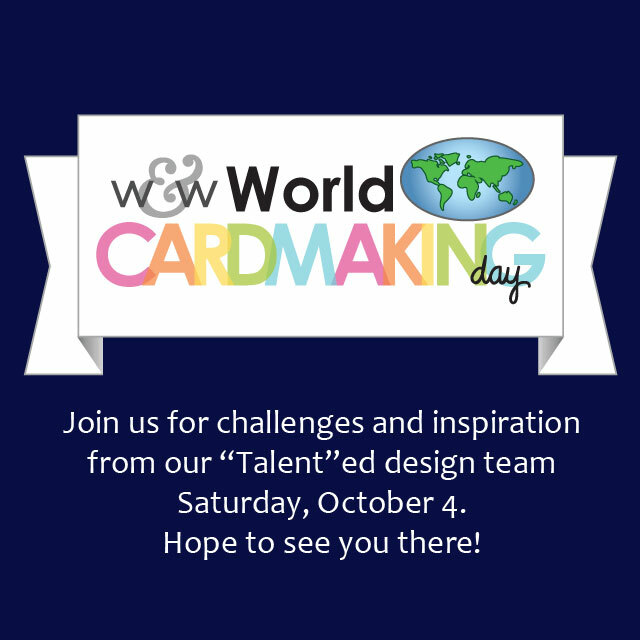 Happy World Card Making Day to you! Hello Miss Darnell wouldn't it be a wonderful world if that would happen and you are celebrating this special day in style, your card is GORGEOUSSSS, beautiful background and that sunflower is fantastic, I looooooove the curly cues that's a brilliant addition to the card, thanks for sharing hope you have a wonderful weekend..
Oh wow! Your card is fabulous Darnell. You knocked the fusion inspiration out of the park! That is one fantastic sunflower - your card is breathtaking, Darnell! Happy World Cardmaking Day :). Safe travels, and have tons of fun! Your happy sunflower card brightened up this grey and rainy morning here! Thank you! Enjoy every minute of your time with your family and friends! Safe travels! This is GORGEOUS, Darnell! What a beautiful sunflower and I love the loopy twine. Happy WCMD! This is sooooo pretty Darrrrrnell! I love sunflowers because they are so cheerful and you can't help but smile when you see them. Thank you for the comments on my Japanese card by the way - think you are right about my retired Geisha status!!!!! what a gorgeous layered sunflower Darnell! and such bright sunshine lighting it up! a beautiful happy card! Thanks for joining in the Fusion Challenge! Gorgeous sunflower and adore the wooden center!! You have lots of beautiful NBUS, Darnell! Fabulous color and love what you did to the flower's centre! Gorgeous Darnell, what a beautiful flower, a truly lovely creation. Dear Darnell, your sunflower card is amazing. I did not know that the card making day exists. :-) I have to remember this and join this event next year. Love your sunflower and all of the texture, Darnell! Goegeous card Darnell! I will be making my W&W card tonight! Happy WCMD! Happy WCMD to you, Darnell! Love your big bloom!!! Happy WCMD Darnell and have a happy holiday if you are there, or traveling to your destination! I love your fusion card, beautiful bloom, colours and shimmer on that center and leaves! What a great big flower and it looks fabulous, great card. Happy WCMD! Love that giant sunflower. Awesome sunflower card. I love all the little extras you added. 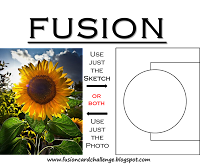 Especially the fiber in that area under the center of the sunflower. I'm glad you were able to jump in and celebrate WCMD! And what a pretty celebratory card this is! I celebrated with a family visit and haven't been near the craft room except to bring down extra chairs for dinner. Hope to have a late celebration tomorrow! Hope all is well with you. This card is gorgeous! I love it. It may not have worked for W&W, but it was perfect for your other challenges! I like how the paper extends beyond the stamp. It creates a really unique effect. I really wish I was at my own house with my crafting room at my disposal so I could participate in WCMD! All of the creations being shown off are just spectacular. Gorgeous sunflower, Darnell! I love how you created all that wonderful dimension and texture...Such a beautiful fall card! So glad you joined us at ATSM this week! What a happy and beautiful card for WCMD! Sadly I didn't get to make a card on the day because I was at a Happy Stampers Show, stocking up with more items for my NBUS pile! Have a great break my friend. That giant sunflower is so pretty with the twine and big shiny center! Again, wishing you fun and memorable travels while you're visiting your sister(s)! Beautiful sunflower Dolly. Love the texture from your embossed brick background and the addition of the looped twine. Fabulous design. Card Artist Extraordinaire...yep, that's you! This card is mouth agape stunning! The sproinky twine and the wood button center are the perfect rustic/outdoorsy embellies for your cool sunflower! Great card pal. Hope your WCMD was a lovely day, Darnell!!! Your sunflower is beautiful!!! and ooohhhh I love that stunning button and the lovely twine bow!!! Love that EF you used as a bg!! Beautiful card, Darnell!! Beautiful sunflower, Darnell. What would be better to celebrate WCMD? Probably many other stamps... :). Hope you had a wonderful crafty day, and thank you for the tip about W&W. Darnell - I think your sunflower card is beautiful!! Love the color and the way the leaves look and that sunflower center looks so awesome and real!! Love the twine and the brick embossed background!! Awesome details that sum up to this rocking card!! Have a glorious time!! A very bright and cheery card Darnell, I like the background embossing too! Thanks for sharing with us at ATSM! Your card is amazing and love the way you interpreted the inspirational image. The sunflower is awesome and definitely makes a statement! Such a pretty card!!! Sounds like you enjoyed WCMD! ;) Enjoy your break! gorgeous! Love the texture and papers! Thanks for playing at Fusion! Oh how beautiful, Darnell! I keep debating whether to order that die & you've just moved it up on my wishlist! YAY for card making day right!!!! Love thos FUN FABULOUS bloom and green accents!! Thanks for joining us at FUSION, so HAPPY you did Yahoo! Beautiful Darnell, such amazing dimension! What a wonderful character you are Darnell!! Thank you for your lovely comments on my blog, & wow your blog is so fabulous & your writings amazing!! Enjoy your meetup!! Such a cool, sunny sunflower! So perfect for WCMD! Makes everyone smile! Oops - forgot to say - Thanks for playing with us at ATSM! Gorgeous card Darnell! I just love that beautiful shiny center! Love your cheerful sunflower card, Darnell! I have this same SU pattern paper pak and have used it with my sunflower stamp too. Darnell...this is just beautiful. I love all your wonderful detail and how fun it is to have a day for all of us card makers, so fun. Looks wonderful. Love the jute twine behind the flower! Congrats on your HM for this card. Congrats on your HM at Fusion (and thanks for the heads up on mine!). Love the texture and depth you've created on this card. Fabulous Sunflower card. So big and bold and happy.